Updated Under-performing data protection biz Commvault is under pressure from activist investor Elliott Management to make board and operational changes alongside a share buy-back programme. Elliott has previously agitated for change at a whole raft of tech infrastructure companies including Brocade, Riverbed, NetApp and Symantec. After evaluating Commvault with the help of our team of advisors, we see Commvault as an incredible product success story. However, having built a great platform with high-performance products is not synonymous with having a well-functioning company today. As is often the case when there are fundamental business issues, Commvault has also not been a successful investment for its shareholders. We believe Commvault's issues are widespread, including its severe margin underperformance, suboptimal financial targets, recurring execution issues and lagging corporate governance. We believe these issues are fixable, but Commvault faces critical decisions in the immediate term. CA, NetApp, Oracle and Symantec have consistently outperformed Commvault over nearly all time periods within the last five years despite low or no revenue growth and greater industry headwinds. As ever with the activist investor playbook, Elliot has bought a 10.3 per cent stake in Commvault and is gunning to get its nominees on the board to drive operational changes, with the support of disappointed shareholders. The letter asserted that Commvault's "strategy, operations, execution and leadership over the past eight years have failed to generate returns to shareholders, despite a leadership position in a growing market with a product set that customers like and competitors respect." In a software market bifurcated between high-growth companies on the one hand and high-margin companies on the other, Commvault is neither. Instead, it has delivered mid-range revenue growth and margins of just 10 per cent. In fact, Commvault's operating margins today rank as its lowest margins in more than a decade despite revenue growing to be more than 4x as large over the same period. The letter stated: "As the chart clearly shows, Commvault's level of inefficiency is an extreme outlier in the industry. 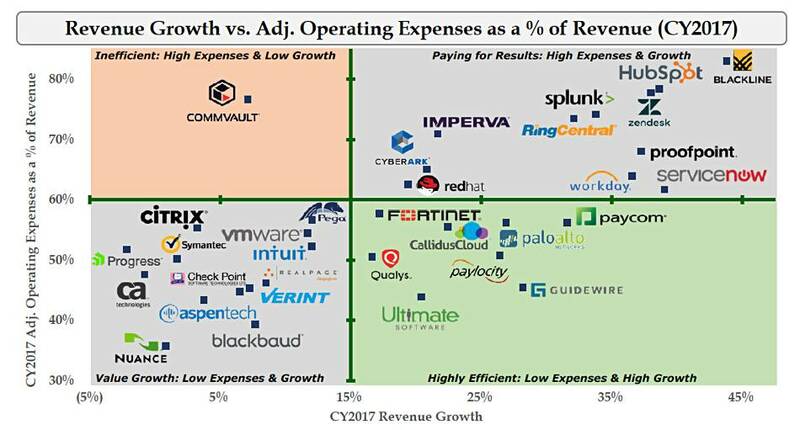 For example, almost none of the companies in this group spend more than 75 per cent of revenue on operating expenses, including companies that are growing more than 25 per cent per year such as Palo Alto Networks, ServiceNow and Proofpoint. "Companies in this group that are growing less than 15 per cent per year ALL spend less than 56 per cent of revenue on operating expenses, representing a gap of 2,000 basis points [20.00 per cent] relative to Commvault." Aaron Rakers, senior analyst at Wells Fargo, generally agreed. "Commvault's inflated opex relative to revenue growth has been a point of investor consternation," he said. Elliott added: "After subtracting its stock-based compensation expense, Commvault is now operating at a loss. "Commvault's returns have been particularly disappointing over the last five years, where recurring execution issues and a dramatic decline in operating income have weighed heavily on the stock." Elliott's list of diagnosed Commvault ills include: "Numerous operational issues driving Commvault's inefficiency, including complex licensing, unrealistic quota-setting, ever-changing sales coverage and high employee turnover in some functional areas." These operational efficiency issues can be summarized through the often-cited "Rule of 40" metric for a software company where revenue growth plus operating margin at a well-run company approximates 40 per cent. Today, Commvault is operating at approximately half that rate, one of the lowest ratios across the entire software universe. This gap underscores the improvement opportunity available, which we believe is fixable in the near to medium term. A full organisational change, "which often requires talent in the form of executives who have seen these issues before and who bring fresh perspectives"
The letter added: "Commvault maintains a highly inefficient balance sheet with nearly $450 million of cash ... [This] level of cash is unnecessary and highly inefficient." So "Commvault can invest in its own stock by shrinking its share base immediately and setting a proper capital return program." Elliott has also asked for "a comprehensive, multi-year capital return program comprised of an accelerated share repurchase (ASR) this year and a minimum percentage of future cash flow dedicated to share repurchases thereafter." William Blair analyst Jason Ader commented: "Frankly, we are not at all surprised by this news as activist involvement seemed to be inevitable given Commvault's depressed valuation, low operating margins, and recent mis-execution. In its letter, Elliott makes a compelling case for change at Commvault and hopes that the board will work together with Elliott to reach a collaborative agreement on the path forward. "The big unknowns from here are: 1) whether Commvault's board will acquiesce or fight these proposed changes; and 2) whether the board will explore going private as part of any operational review." Ader added: "The criticism of Elliott has been that it is too short-term focused, with feel-good income statement improvements coming at the expense of long-term strategic investments and positioning. Commvault conducts open communications with its stockholders, and the Board of Directors and management team values their input. Commvault has had initial discussions with Elliott and we go into these discussions with an open mind, a goal of enhancing stockholder value, and [we are] optimistic for Commvault’s future.